Almost everyone advises new owners to take their car to an autocross to find out how the car behaves. I decided to heed the recommendation, but was unsure if my stock setup could cope with the demands of an event. A couple of respected builders recommended that I change the stock oil pan to one more suited to racing. So I called Gordon Levy and purchased his Road/Race Pan setup. 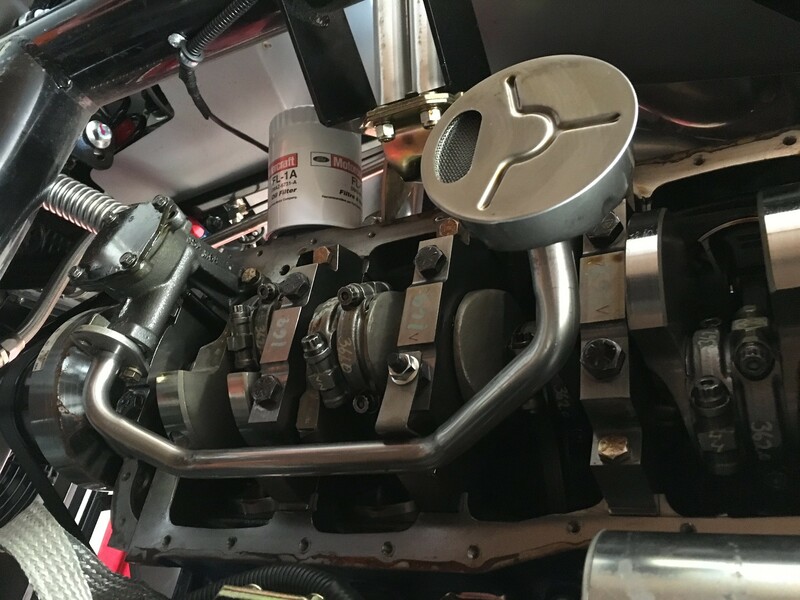 Gordon provides a Champ oil pan (https://www.champpans.com/products/p/cp302lt-rr/), associated oil pickup, and dipstick/dipstick tube. The drain plugs and dipstick bungs are 1/2”-20. If you don’t have an oil temperature sensor, you’ll need to purchase a 1/2” NPT plug for the pan’s bung. 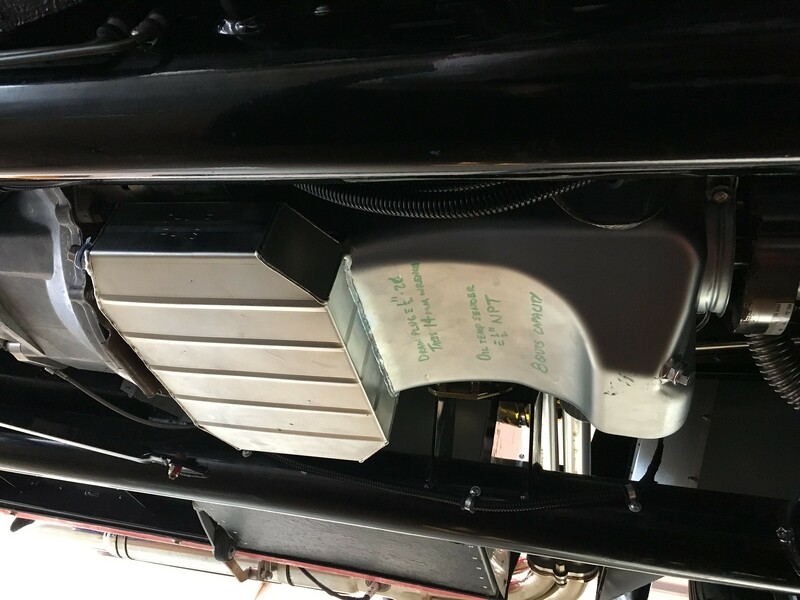 You’ll also need an oil pan gasket; I chose the Fel-Pro OS 34508 R one-piece gasket based on lots of great reviews here and on the other forum. PRO TIP #1: With the drain plugs in place, fill the pan with water & check for leaks (you’re gonna want that bung; otherwise you end up with a counter full of water!). On mine, the forward plug was fine, but the rear plug leaked at least a drop of water per minute. I switched out the crush washer for a fiber one, and the leak went away. My buddy Scott skipped this test, and he’s got an oil leak, which in light of my test, he thinks is probably at the drain plug. PRO TIP #2: [EDIT: original text deleted, 'cuz it was bad information] New tip: With the dipstick in place, fill the pan with enough water to just reach the windage tray. Then add two quarts more. [This two quarts represents the oil that's in the upper engine at operating temperature. I chose 2 quarts based on this: http://garage.grumpysperformance.com...ge-tray-do.64/]. Check this level against your dipstick, and adjust accordingly. Neither Scott nor I did this test initially. Removing the stock pick up was easy-peasy. Installing the new pickup proved a little more problematic. I replaced the pickup bolts with Arp studs. The problem is, I tried to torque the studs into the oil pump, and promptly broke the cheap-a$$ pot metal. So now I had to replace the oil pump. The bolts into the block were secured with red loc-tite (the bolts for the pickup weren’t), so it took a bit of heat to get them loose. I went to Napa and bought a new pump (https://www.napaonline.com/en/p/SEP22441118); I did NOT replace the oil pump drive shaft as it was an Arp and had less than 700 miles on it. I re-used the Grade 6 oil pump bolts (with a light-to-moderate dose of red loc-tite) and torqued them to spec (23-38 foot-pounds; I chose 25). Once the pump was in place I hand-tightened the studs and tried to fit the pickup onto the studs. No joy. The studs were just a hair too close together. So I drilled the pickup’s mounting holes 1/32” larger in diameter, & finally was able to set the new pickup into place. It was then that I noticed the main cap stud had to be moved. A panicked call to a couple of friends revealed I “should” be able to swap the stud with the main cap bolt. I confirmed this with Mike Forte (who answered his cell on a Saturday afternoon…you don’t get customer service like this very often; thanks Mike!). So I broke out my breaker bar, swapped the stud & bolt, and torqued each to 65 foot-pounds. After that I was able to install the pickup (torquing the bolts to the oil pump to 25 foot-pounds and the nut on the main cap stud to 30 foot-pounds; I used a drop of red loc-tite on each). I then dry fit the pan into place. It took some fiddling, but I was able to get the pan into place working around the bump outs on the bell housing block off plate. PRO TIP #3: You do NOT need to remove the starter. If you do, you’ll figure out there’s no way to get the starter back into place with the oil pan installed. Ask me how I know. Another test fit or two to verify the space between the bottom of the oil pickup and the oil pan (mine cleared with a little less than 7/16”) and to get my fitting process dialed and I was ready for the real thing. I smeared a pea-sized drop of Permatex Ultra Black RTV onto the corners of the gasket (both engine side & pan side) and set the gasket into place. I was only able to use three of the Fel-Pro fitting studs due to the bell housing block off plate. For the fourth, I used a long 1/4” bolt with a nut screwed onto it about an inch. I slipped the pan onto the fitting studs & then the metal side supports. Finally I screwed all the bolts into place hand tight and let the RTV cure for an hour per the instructions. 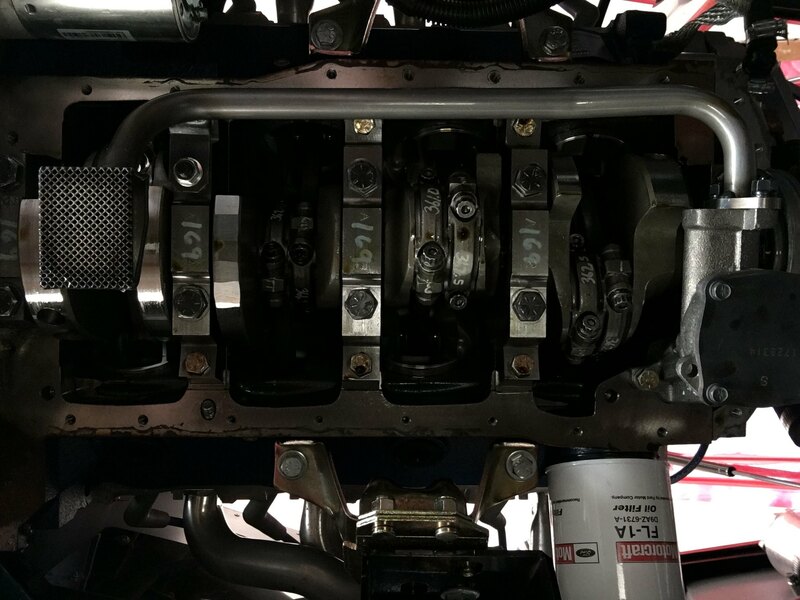 I torqued the bolts to spec (10-12 foot-pounds for the 1/4” bolts, 15 foot pounds for the 3/8”) in three stages, working from the middle of the pan out to the ends & and swapping sides a la the pattern used to torque the intake. Getting to the bolts on the opposite side of the sump was a real pain; you absolutely need a flex drive socket and long extension. At last the pan was in place. The final step was to bend the dip stick tube to fit around the engine block. I used a piece of 3” PVC pipe to get the tube to curve smoothly. 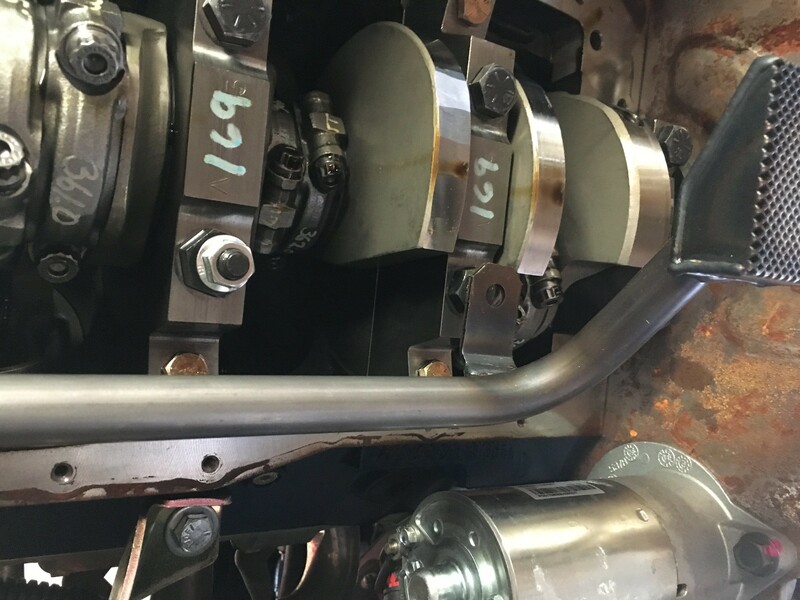 You’ll want the first curve to start right at the fitting to the oil pan, so either use a tube bender or a vise to hold the tube & PVC in place. This project turned out to be a TON of work, mostly because I’ve never done it before. If you’re thinking about autocross or track days, I urge you to have your engine provider install a race-ready pan, or at least make the swap before the engine is in the car (& preferably before the bell housing is bolted on). Last edited by phileas_fogg; 04-15-2019 at 06:18 PM. After letting the RTV cure for 24 hours, I filled the pan with oil. No leaks overnight, so today I took the car for a test drive. After returning from an hour-long run…I’ve got a leak at the rear. I re-torqued the pan bolts, but I’m pretty sure I get to take the pan off and start over. I’m thinking I probably can’t re-use the brand-new Fel-Pro gasket. And I’m guessing my problem is either not enough RTV in the back corners, or the gasket “hoops” are not straight in the channel. The gasket did seem a little loose; I assumed it was supposed to be that way. EDIT: At least the oil pump & pickup worked. Pressure started at 65 psi, then dropped to 45-55 when cruising (36 psi at idle when warm). Last edited by phileas_fogg; 04-11-2019 at 04:08 PM. What is the reason for the shape of the pan bottom & how do you do am oil change with that pan? BTW on the 8QT dipstick measure, do the measurement on the stick after the engines is run so the oil galleries & filter are full. EDIT: Some very important comments have been posted to the "other" site, might save an engine. Last edited by BEAR-AvHistory; 04-12-2019 at 12:17 PM. I feel for you John. Sounds like my experience last year when I changed my oil pan. I still haven't tried to fix the rear leak. I did not enjoy the whole job. I will have to save the Royal Purple I used (that stuff ain't cheap). The QuickJack lifts should make the job a lot easier. The pan is basically stock except the rear sump has been cut out & a slightly shallower but much wider “box” has been welded in. That gives the additional capacity vs stock. Just like stock, there are two oil drains on the pan: one at the front & one at the back. The rear drain is the pan’s low point & has a magnet on the pan side of the plug. P.S. Yes, the responses on the other forum are very helpful. For starters, the 8-quart capacity is for a FULL filter & FULL oil galleries. I’ll be editing my initial post accordingly. We find all aftermarket pans have a rocker to them from the additional welding. Although FEL PRO says no, we smear a thin film of RTV, we use the gasket maker stuff (right stuff) expensive but only doing this once. We use this film of sealant all the way around first on the pan and then on the gasket or block which ever is easiest we put the gasket on the block with the pins and then put the pan on torque and leave overnight. Fill pan run for 5 minutes and mark the dipstick if not using the supplied dipstick, or verify the supplied dipstick. JMHO, HTH, Richard. Need help finishing your project we can help here or at your shop. FFR coupe 3617CP 331 Stack EFI T-5 IRS Cobra brakes, AC/heat. Both cars by NRC, we can build (and have built) any FFR product. We also make and sell a ton of great parts for the FFR community. Brake kits, AC systems, #1 supplier of Team III wheels.